When you see those careful sipping rises, it’s time to tie on an emerger. 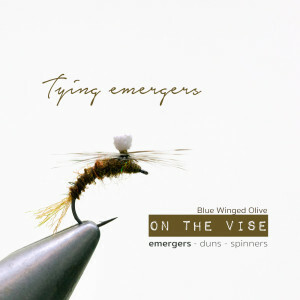 Very often emergers are the most efficient approach to fly fishing. 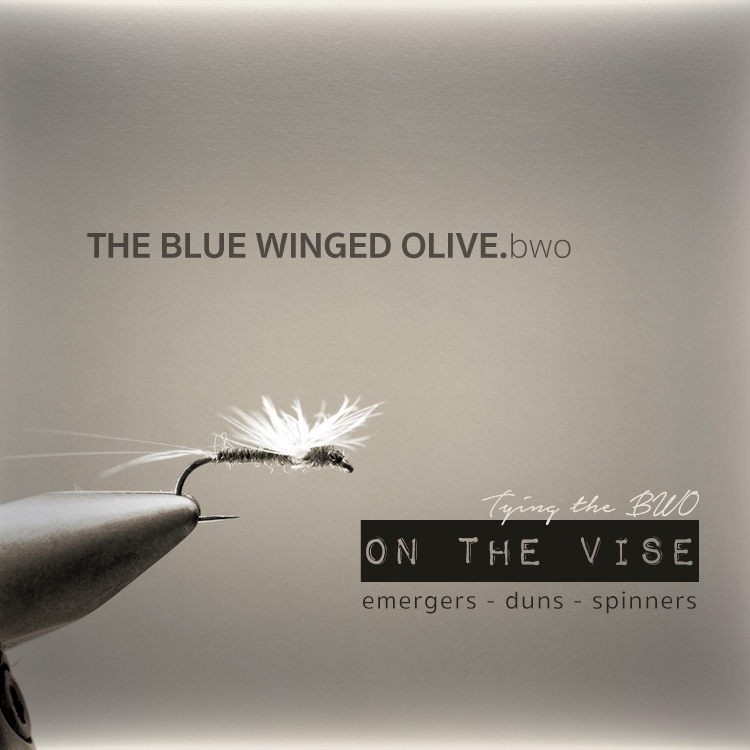 Tying BWO Emergers is easy. 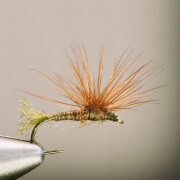 Here’s an article on how to prepare for the next BWO (Baetidae) hatch. After reading literature on aquatic insects and fly tying, I guess it’s fair to say that the legendary book ”Selective Trout” by Swisher and Richards was one of the first to put an emphasis the importance of emergers. 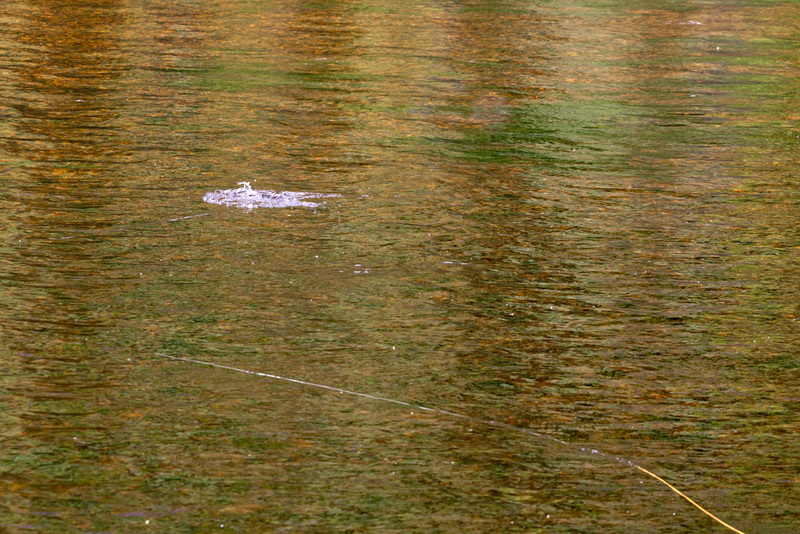 The emerger approach is very often a winning strategy in fly fishing. The reason is simple. Trout and Grayling are efficient feeders. They will always choose the prey that yields the most energy compared to the energy used catching it: Fish always go for the lowest hanging fruit. Emergers are easy to pick because they are unable to escape from the nymphal tangle they are in. To make matters even worse, emergers are trapped in the surface film, trying to get out. This is the second of five article in the series on the Blue Winged Olives where I focus on the most important mayfly hatch in several rivers. The BWOs are a broad definition that stretches across several species and families of may flies, but all point to the olive hue in the may fly’s body and blue/grayish tint in the wings. In my waters those olives usually are in the Baetidae family. The surface film presents a barrier to emerging mayflies trying to metamorphose into a winged adult fly. The tension of the film is simply to strong for the bugs just to pop trough it. They’ll have to work their way through. Emerging mayflies stuck in the film are on a suicide mission. Several of those nymphs use as much as 20 minutes before they break the film, and blossom into an adult mayfly. Fish can see that, and they understand that a mayfly in the film is a safer bet than an adult sailing the river – ready to take off. Feeding on emergers is cherry picking for hungry fish. Very often you can see adult mayflies on the water and trout rising steadily. You tie on your best dun and swing the rod to give the perfect drift and presentation. Certain of a catch you experience what everyone does at times: The fish won’t take the dun. You change size, color and pattern. But the trout doesn’t seem to care. What is happening? Very often the fish is keyed in on emergers, and not the dun. Even when you see those beautiful sailboats on the water, and it looks like trout is feeding on them, they are in fact feeding on emergers. At those instances – it’s a dead end strategy to change for a dun pattern. Change for the emerger because the fish won’t see the dun. They only see emergers because they are the easiest to catch. The transition from nymph to an adult insect is a dynamic process where the bug changes appearance continuously. The emergent insect really does not look like a bug. Wings and the shuck whirl in the water, making the soon to be beautiful mayfly look like a plate of tangled miniature pasta. The perception of the bug’s size change as the shuck departs from the body. At one point they seem to be double the size of an adult (or a nymph, for that matter). Thus there is no single look for an emerger. You know what an adult look like, but it’s virtually impossible to know what an emerger looks like. The only thing you’ll know is that they do not look like the tidy ones you can buy in the fly shop. Emergers are messy, buggy and chaotic variants of their beautiful alter ego in the next stage of their lives. The BWOs and the Baetidae family of may flies love to hatch when it’s raining and in a short period after the rainfall. I always go fishing when it’s raining. Why the love of bad weather? I firmly believe that the explanation is simple: The drops of rain breaks water tension, and gives the BWOs easier passage through the film and into open air. It’s easier to break through the film when the tension is low – therefore they hatch when it’s easy to hatch. A rational explanation, in other words. Hatching in high humidity forces the may flies to sit longer on the water before they are able to take off. This creates an interesting, and paradoxical, situation where trout often ignore the emerger and get keyed in on the dun. In my waters, this often happens when the Baetis Rhodani’s are hatching. This happens because the duns tend sit to long on the surface before taking off. When there are a lot of duns sitting on the surface for a long time, it is often a smart choice to leave the emerger in the fly box and tie a dun to the tippet. In such situations, I highly recommend using the Sparkle dun, the Baetis flymf or the Bubble Emerger. These patterns seem to outfish all other patterns in my repertoire when the Baetis Rhodani duns are born. So if emergence is a process and not a solid state, how do you tie them? What are the sound principles for tying bugs that look like chaotic hangover variants of their beautiful alter ego – the dun? Well, Rome can be reached any number of ways. I follow these four principles when tying emergers. BWO emergence is a level process: Many tie emergers on grub formed hooks. They do work, but experience tells me that regular dry fly hooks often work better. This is especially the case for BWO hatches in general, but specifically for many of the Baetidae species. The reason is simple – BWO emergence usually takes place on the horizontal plane (at least close to), not very often on the vertical plane. In such cases I use the Baetis Flymf, The R-Emerger, The Paraloop Emerger, the Bubble Flymf or even the BWO Sparkle Dun (see pattern database here). You will not be disappointed. The messier the merrier: Either I’m tying on a grub hook or a regular dry fly hook, I tend to prefer Hare or Squirrel dubbing. The spiky character of this material creates a lovely buggy impression beyond compare. I guess the spikiness resembles the messy appearance of the emergent bug. The messier the merrier, in other words. I have more than once experienced that a worn out fly is out fishing a new bug. 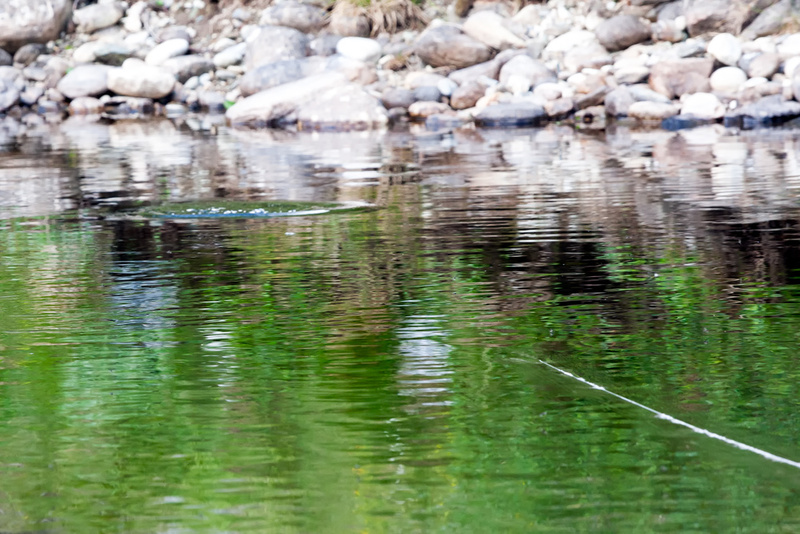 Therefore – go messy when you tie the emerger. Size is less important: Because the insect is changing size and form throughout the emergence phase, size is not as important as it is for the duns. It’s better to go large than small when you’re at it (don’t go crazy on size, of course). Color is easier on emergers: Color is easier for emergers, than for their adult counterpart. 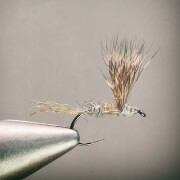 Use brown with a hint of the color you’ll find on those mayflies that have survived the hatch. Brown and Olive tones for most BWOs. Stick to one pattern: Although I am the prominent sinner when it comes to minimalism, my advice is to find the pattern that works and stick to it. It will probably work on all BWO hatches. 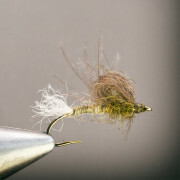 This is a floating nymph, and one of my favorite patterns for those BWO hatches. I just love the versatile nature of the fly, and how it performs in difficult situations. An emerger for my taste. Floats in the film and has a nice buggy apperance trout love. Tied on an unusual hook for this fly type. A fabulous fly and probably the best general may fly pattern that is. It’s catching fish during the entire hatch cycle and would probably be the fly i’d choose if I only could bring one fly to a BWO hatch. 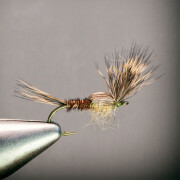 The Hare Emerger is easy to tie and has a buggy appearance that both I and the fish love. This is my variation on a common theme. In his book “The Educated Trout” Bob builds a strong case for this buggy fly. The really cool fact about this fly is that it’s good at both mayfly and caddis hatches. The articles in this series will dive deeper into different topics of tying the important Blue Wing Olives. Two are now available, and the rest will follow suit. They will cover the basic principles of the emerger, but probably also some alternative views on approaching the emergent state of the BWOs.